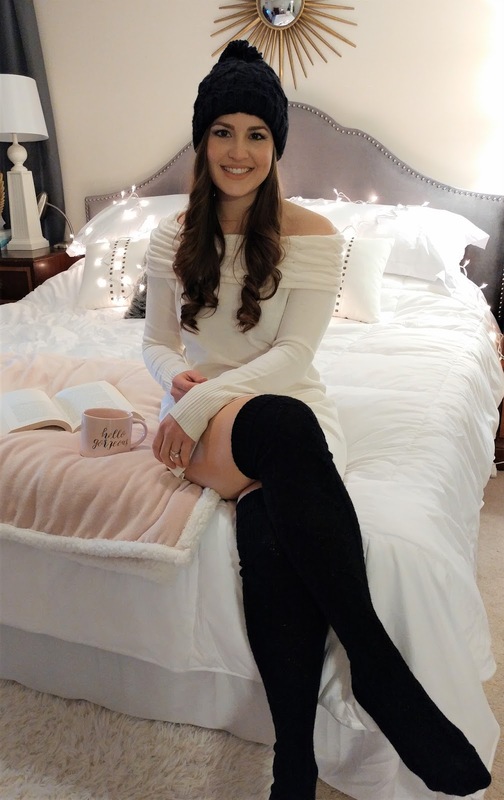 When it comes to my evenings, once the kids are in bed and I finally get some me-time, I want to make my time as relaxing and enjoyable as possible. That's why we recently redecorated our master bedroom, and have made a special effort to keep it clean and pretty. It's our sanctuary away from the clutter and chaos of two very young children. So, how do I create a cozy and relaxing environment to enjoy my few moments alone? 1. Make yourself a mug of herbal tea. I definitely go sans-caffeine in the evenings, but a mug of herbal tea or even a glass of wine will definitely end your night on a relaxing note. 2. Invest in some faux fur pillows or throws. I love the look of faux fur in a bedroom. I think these little pillows instantly add a touch of beauty and make the bed look so inviting. 3. 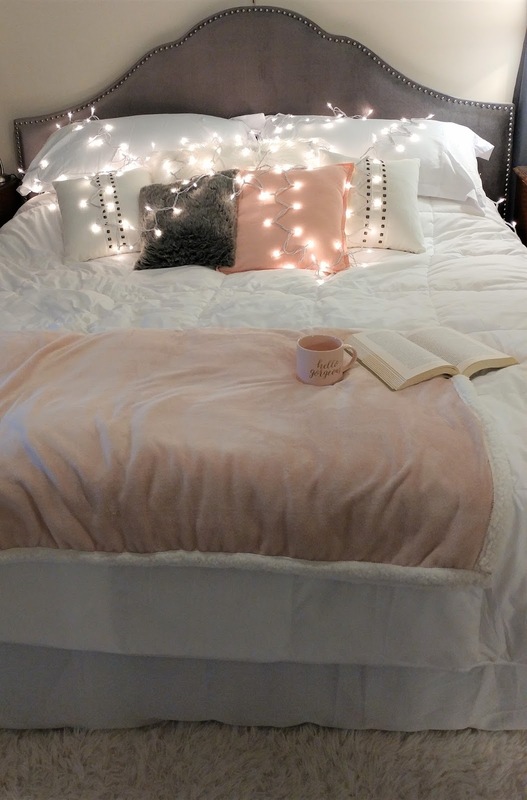 Add twinkle lights. Of course, you can't leave the light strands where I have them... You have to sleep there. 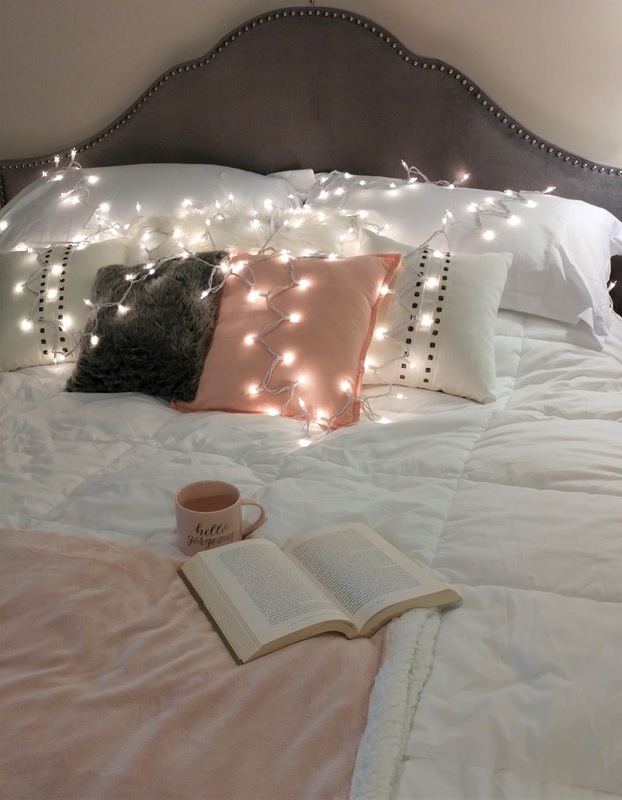 But twinkle lights over the headboard or around a full-length mirror are a pretty, more permanent option. 4. Wear fuzzy socks and comfy pajamas. I try to change into comfortable clothes in the evenings so I can fully enjoy my time without the restricting jeans or sweaters I might wear during the day. 5. Take a warm bath. I take a warm bath most evenings, and it's the most wonderful feeling to lay down in a clean bed when you're also warm and clean. 6. Read a favorite book. One of the worst things for your sleep cycle is to look at your phone late at night. Reading a book is a better option for your eyes and your brain. I hope some of these inspired you to create a more relaxing atmosphere and routine in the evenings. They don't take much effort, but I can tell you, the payoff really is worth it! Such a nice look and what a pretty look. I love the lights on the bed. Totes agree on these tips! Ever since I stopped doing anything but sleep and loving hubby(🙈) in our room, it's made such a difference. haha yes!! My tea and coffee has been improved by my cute pink mug too! Great Tips! 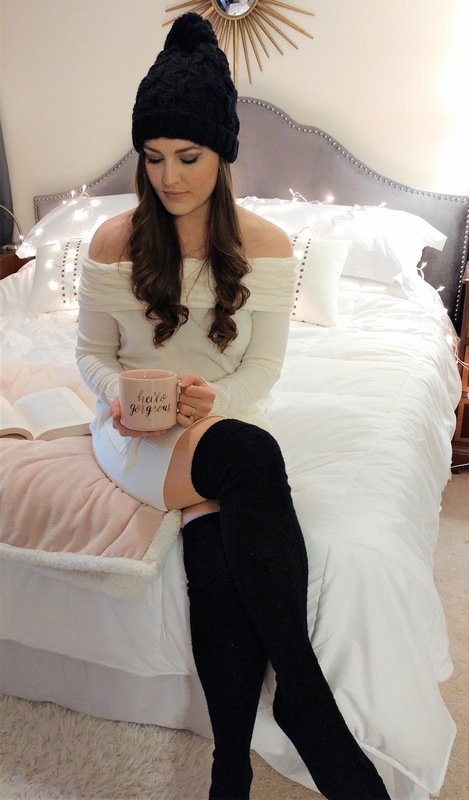 Your room decor and coffee mug are just adorable! I love a nice relaxing bath too, nothing beats it. 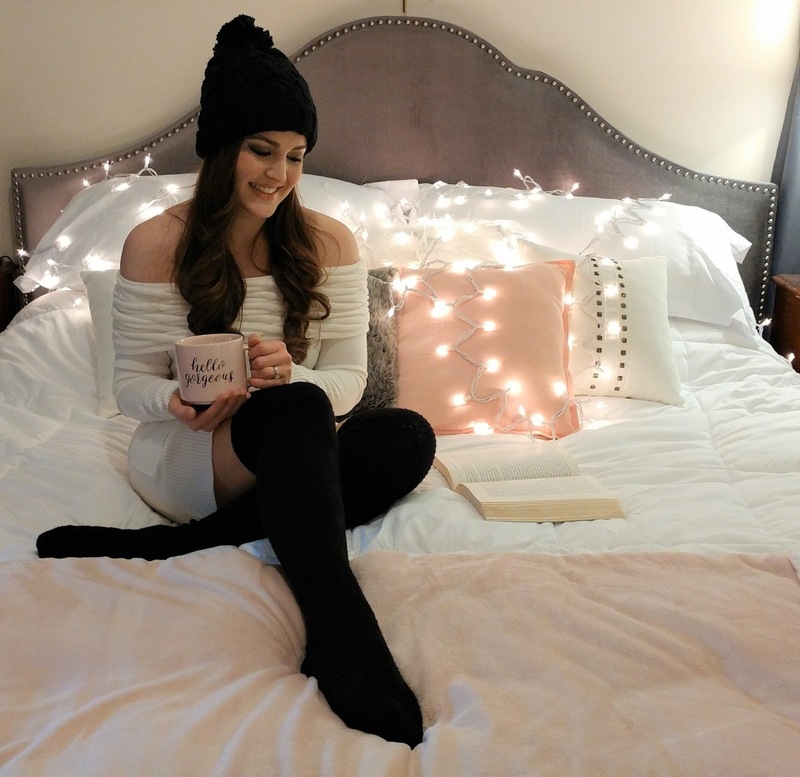 I shared some of what my night routine includes on my blog recently as well! Seems to be a topic on many peoples minds these days, but hey, great minds think alike! Thank you so much Ray! !